Watch and learn which yogurt and energy bar has the least sugar, on 5 Minutes to Fitness+ TV. You may be surprised. I recently finished redesigning the menus from my Core Energy Program book. You’ll love how balanced they are with calorie content and easy to access, delicious foods that will help you eat great wherever you are! The menus are based on your BMR which you can find out by using my Fit Lifestyle Tracker. You need to be a club member to get access to the 8 updated menus. I recently posted asking you if you’re eating a great breakfast. The answer was yes, right? 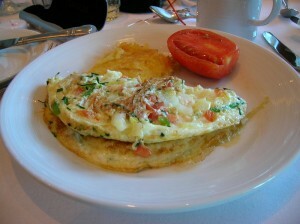 The picture above is one of my favorites, and Jane’s too (see below); egg white veggie omelet. Here are 3 breakfasts from Fit Friends’s Revolution members, Jane, Elizabeth and Juanita, that are fast and healthy and will jump start your metabolism and give you the energy to be great! 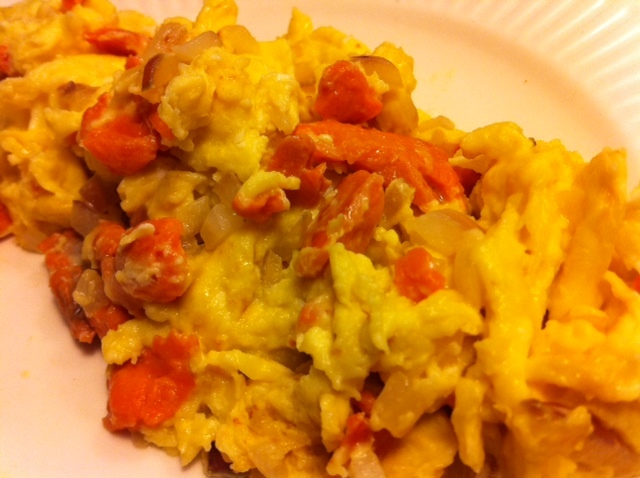 One of my favorite breakfasts right now is a frittata inspired by Elana and Peter’s video. I usually make it on a Sunday and then just heat it up during the week. I saute Trader Joe’s onions and peppers in a very little bit of light olive oil and then I add pieces of chicken sausage and artichoke hearts. When that has been cooking for about 5 minutes I add egg whites and cook on the stove until it starts to set and then I put it under the broiler until the eggs are firm. After it cools I wrap the frittata in individual servings and eat throughout the week. Sometimes I will have this will an Ezekiel sprouted grain tortilla and some blueberries. My favorite breakfast is cooked steel cut oats (1/4 C. raw) plus 1 tablespoon flax seeds with 1tablespoon dried bluberies. Serve with 1% or non fat milk. FFR members: reply to this email to leave a comment. The best breakfast. Are you eating it? The first question to ask is, “You’re eating breakfast, right?” You know it’s one of the most important meals to get your metabolism going, giving you energy for your day, and essential after your morning workout to refuel your muscles so you get more tone. I want to hear from you. Leave a comment below telling us what you’re favorite breakfast is. Not sure if it’s healthy? Send us the ingredients and we’ll analyze it for you. 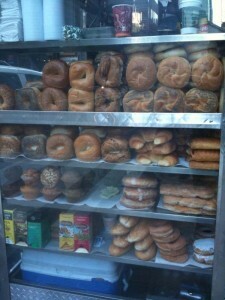 In fact, I’ll post the healthiest breakfast winner later this week. Are you eating the healthiest breakfast possible? Leave a comment by replying to this email or click here to tell us about your favorite breakfast, or with any questions you have about a healthy breakfast. 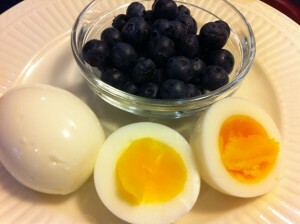 My favorite breakfast these days is 2 organic hard boiled eggs with a 1/2 cup of organic blueberries. This gives me the protein to build muscle and the energy I need to start my day along with protection against cancer, heart disease, diabetes, obesity and Alzheimer’s Disease. Hopefully you didn’t have anything in the case above. What was the quality of the food? Did it have excessive sugar, fat, salt and preservatives/chemicals? Could you have made a better decision? If yes, what? Why didn’t you make a better decision? Everyone I ask wants 3 things: to lose weight, have more energy and less pain. Breakfast is a chance to get all 3! Tomorrow make a great choice. Just do it.